Young actress who landed a starring role on the Amazon original television series Just Add Magic. Her major TV debut came in 2012 when she appeared on American Horror Story. Her guest starring credits include Criminal Minds, Anger Management, Suburgatory, and American Horror Story. She is from California. 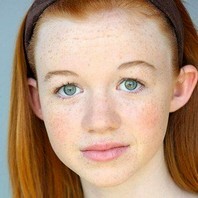 She and Olivia Sanabia are two of the leading actresses on Just Add Magic.